Cherry Mobile Flare S3 Mini vs MyPhone Rio 2 Lite: Which quad-core smartphone to buy? This week, we compare the Cherry Mobile Flare S3 Mini to the MyPhone Rio 2 Lite. See who emerges as the better handset here! Cherry Mobile Flare S3 Mini is one of the upcoming smartphones featured from the popular CM marketing material that has made its way online. This smaller sibling of the famous Flare S3 will sport a 4-inch IPS display and will run on 1.2-gigahertz quad-core processor. Once it'll be released in the market, the Flare S3 Mini will be instantly pitted against the MyPhone Rio 2 LTE in the local market. Check out our comparison post right after the fold. Currently, there's no mention of the Flare S3 Mini's RAM yet; but the fact that it was not highlighted by the company means that we could only expect a 512MB of RAM. Nevertheless, looking into the Flare S3 mini's specs sheet, it could pose a serious competition with the MyPhone Rio 2 Lite. To be specific, the Flare S3 Mini will have a built-in memory of 4GB which is expandable up to 64GB via microSD. On the other hand, the Rio 2 Lite may have a bigger 4.7-inch display but it has the same 3G connectivity and 2MP front cameras as the Flare S3 Mini. It's also worth noting that the Rio 2 Lite utilizes an 8MP Samsung Sensor on its main camera with Blue glass. The Flare S3 Mini is short in terms of screen size while the Rio 2 Lite sports a bigger screen real estate at 4.7-inch. Both have quad-core processors in their gut but Flare S3 Mini runs slightly slower at 1.2-gigahertz speed compared to 1.3-gigahertz speed of the Rio 2 Lite. Although Flare S3 Mini's RAM has not been confirmed yet, it could have a lower RAM than 1GB. Thus, it gives the Rio 2 Lite an edge in this department. S3 Mini's built-in memory is also short by 4GB compared to the 8GB of the Rio 2 Lite. Nonetheless, both have expandable storage of up to 64GB via microSD. The Cherry Mobile runner, has a one-generation old Android OS (KitKat) while the Rio 2 Lite runs on the newest Android Lollipop OS out-of-the-box. Battery is also not disclosed yet for the CM Flare S3 Mini but considering our experience with other Flare models, this may have a lower battery rating than the MyPhone Rio 2 Lite's 2120 mAh. Lastly, the Flare S3 Mini's price is almost 50% lower than the competitor’s device. There's more beef to the MyPhone Rio 2 Lite's specs sheet which is why it has a higher price than the Flare S3 Mini. However, the latter is still one of the better offerings when we're talking about the sub-Php3K division. If you are to choose between the two, I think the major deciding factor would be the price. Is the price difference more than enough to justify the lower specs? Tell us what you think of this by writing your thoughts in the comments' section below. 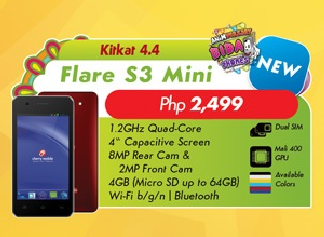 Pinoy Metro Geek: Cherry Mobile Flare S3 Mini vs MyPhone Rio 2 Lite: Which quad-core smartphone to buy?